As I was perusing the book, not particularly intent on making any of them in the immediate future (after all, as long as I had the book, I could always make the quilt, right? :-) ), I happened to turn to a quilt made from RJR's Aurora Ombre line of fabric. I had seen this fabric at a quilt show and bought some yardage of two different colorways, not knowing at the time of purchase exactly what I was going to do with it. (I'm sure all of you appreciate the difficulty of figuring out how much of a fabric to buy if you haven't a clue what you're going to be doing with it) The fabric is *so* different from anything I had ever seen that I just knew that I had to have some. This fabric is manufactured to provide a continuous variation and gradation of color across the entire width. I knew that I needed to find a pattern that would showcase this gradual blending of color. The coloring of the fabric needed to be featured instead of the pieced pattern. And the book showed just such a quilt. I was very pleased because I could make this quilt RIGHT AWAY! I had everything I needed .. the Aurora fabric, the background, the batting and the backing! Hurray! 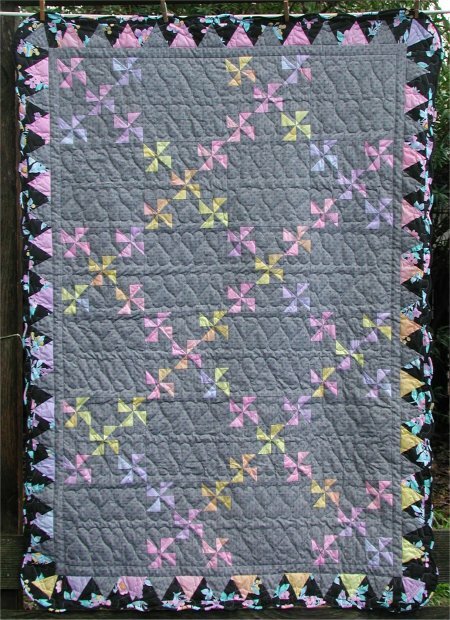 The colorway I chose for this quilt went from pastel lavendar -> pink -> yellow. I decided that I would put a float border of the background fabric and then make a sawtooth border of the leftover Aurora and background fabrics. Originally I thought that one row would be of the Aurora and the other row would be of the background, but once again, I discovered that I didn't have enough of either to do that. After letting this problem simmer a bit more, I decided that if I could find another fabric that coordinated with the Aurora and background, I could alterate the Aurora & background as the first sawtooth row and use the coordinating fabric as the second sawtooth row. I rummaged through my stash and was absolutely DELIGHTED to find EXACTLY the right fabric for the coordinating row! Man, I couldn't have found a more perfect fabric if I had designed it myself! On the black backgrond were flowers of EXACTLY the same colors as in the Aurora colorway! 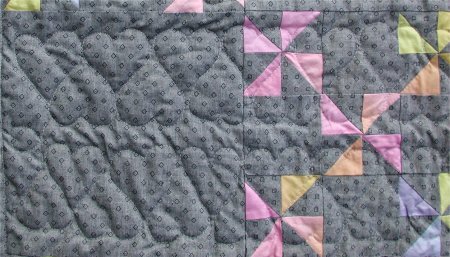 This very dark fabric provided a wonderful contrast to the rest of the quilt without overpowering it. Never one to leave well enough alone, I decided that I didn't want to have a straight-edged finish .... most of my quilts have just a standard plain binding and I was tired of it. So, I asked around the forum for help in figuring out how to achieve an "ice cream cone" look. Basically, it's a triangle with a scallop on the top, so that if held vertically, it looks like an ice cream cone w/ a scoop of ice cream. I wasn't sure at all how to go about creating that scallop look .. what was the technique or pattern one used for cutting out the sawtooth triangle w/ a scallop on the edge? From the very helpful Forum members, I was directed to the "Dear Jane" quilt. After taking a look at it, I realized that this was precisely the look I wanted and it was so easy! 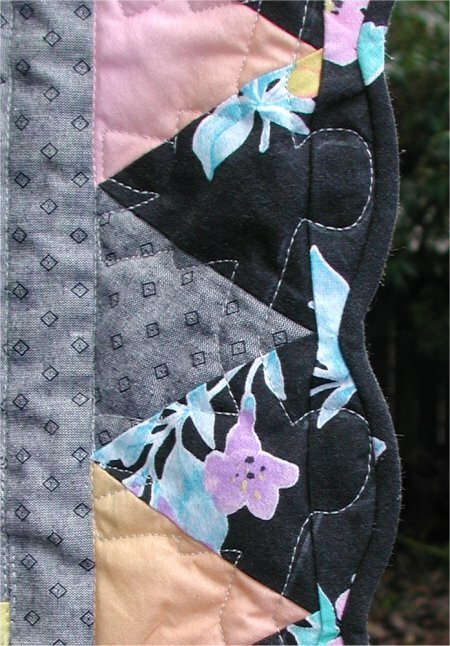 Using the same fabric as the outer sawtooth triangles, you sew a straight strip of fabric as an outer border. Then you cut the straight strip into scallops to match the size of your sawtooth triangles .. you don't do it the other way around! Gosh, that made it so much easier than first cutting scalloped pieces and trying to work with them! I finally decided on continuous line, interlocking hearts in the pinwheel part of the quilt, stitch in the ditch along the float border and a paper doll motif in the scallop border. I actually MADE the paper dolls out of Contact paper and used the stickiness of the Contact paper to temporarily hold that pattern to the quilt while I free-motion stitched around the perimeter. When I came to the end of the Contact paper pattern, I just pulled it up, restuck it to a new area and continued stitching.